Friday 9:00 a.m. – 3:00 p.m. at the Legislative Grounds in Carson City STRONGLY RECOMMENDED in order to avoid the rush on race morning. 55K packet pick-up will also be available at Spooner Lake Nevada State Park on Race Morning between 4:00 a.m. and 5:45 a.m.
START LINE BUSES: 4:15 am and 4:30 am Shuttle vans are available post-event to transport runners back to the host hotels. There is no drop bag service for the 55K. 55K runners wishing to have drop bags available during the event will need to make their own arrangements. 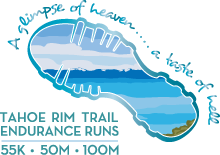 The Tahoe Rim Trail 55K Endurance Run is a 34 mile course that takes place on high elevation alpine and sub-alpine forest trails and dirt roads in the Carson Spur of the Sierra Nevada Mountains. The event is located on the northeast side of Lake Tahoe. All distances begin and end at the Spooner Lake State Park, which is at 7,000 feet. The highest point of the event is just below the 9,214 foot Snow Valley Peak (which also provides one of the best views on the course). The low point is at the bottom of the now “infamous” Red House Loop (A Taste of Hell) at approximately 6800 feet.